Includes over 2,700 exclusively designed custom icons! Moving analog clock icon, current and todays weather icon, and calendar icon widgets included! Ultimate iOS8 Weather and Calendar widgets in the works! 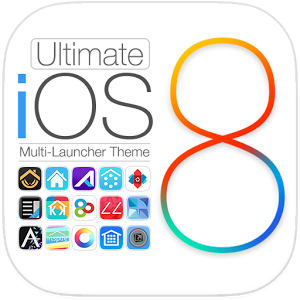 Ultimate iOS8 supports nearly every launcher with FULL support for: Nova, Aviate, Apex, Next 3D (with 3D scene mode support), TSF l, GO, Inspire, Smart, ADW, Action, Holo, Atom, Lucid, CM11 Theme Manager, Solo, KK, and Nine Launcher.